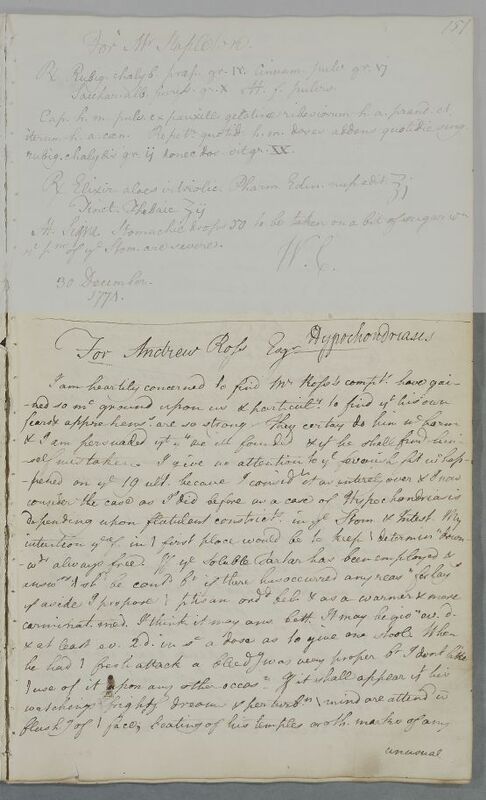 Reply, in the form of a heavily abbreviated transcript (using elements of impromptu shorthand), giving suggested treatment for Mr Andrew Ross who is diagnosed with hypochondriasis which is marked by a constricted stomach. 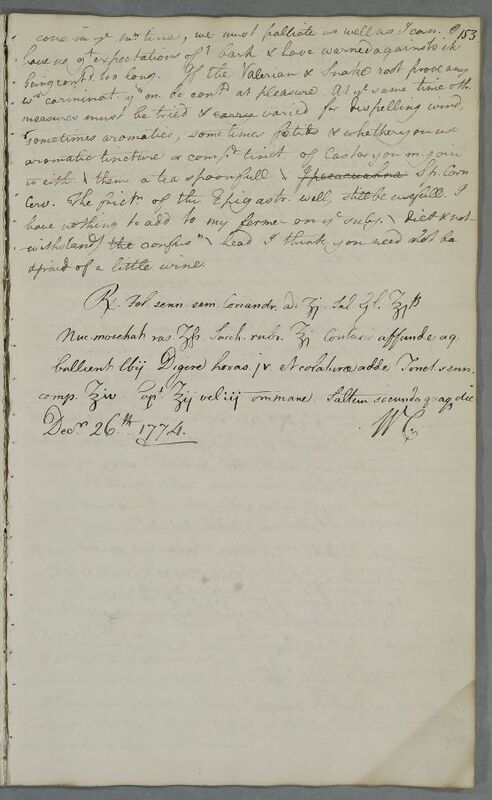 Cullen give detailed instructions on how to apply fomentations involving warm, wet blankets. Addressee established as James Fea of Clestrain from related documents in this case. 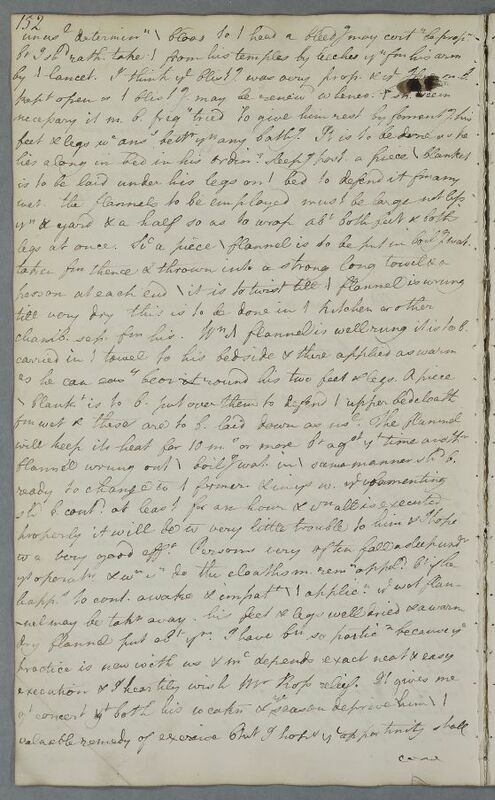 Summary Reply, in the form of a heavily abbreviated transcript (using elements of impromptu shorthand), giving suggested treatment for Mr Andrew Ross who is diagnosed with hypochondriasis which is marked by a constricted stomach. Cullen give detailed instructions on how to apply fomentations involving warm, wet blankets. Addressee established as James Fea of Clestrain from related documents in this case. Case of Mr Andrew Ross suffering from abdominal discomforts and interrupted sleep which eventually leave him delirious. Cullen considers it 'hypochondriasis'. with either of them a tea spoonful of Ipecacuahna S.p. Corn. Take one drachm of Senna Leaves, one drachm of Coriander seeds, one and a half ounces of Glauber's Salts, half a drachm of grated nutmeg and one ounce of brown Sugar. After having crushed them, pour over it two pounds of boiling water. Let it digest for four hours; add, to the strained liquid, four ounces of Daffy's Elixir and two or three ounces of [Capt?]. 1 To be given every morning, and at least every second day. 1: This would appear to be the correct reading of this abbreviation, but since it suggests no common ingredient it may be a matter of misreading or a partial slip of the pen. carminat. med.. I think it may ans. bett. It may be givn. ev. d.
by y lancet. I think ye blistg was very prop. & ye Issue m. b.
legs at once. Suc a piece \ flannel is to be put in boilg wat. flannel wrung out \ boilg wat. in \ same manner sh.d b.
ws carminat. yy m. be cont.d at pleasure. At ye same time oth. w eith. \ them a tea spoonful \ Ipecacuahna S.p. Corn. Nuc. Moschat. ras. ʒjfs. Sacch. Rubr. ℥j Contusis asunder aq. bullienti ℔ij. Digere horas. jv. et colaturæ adde Tinct. senn.